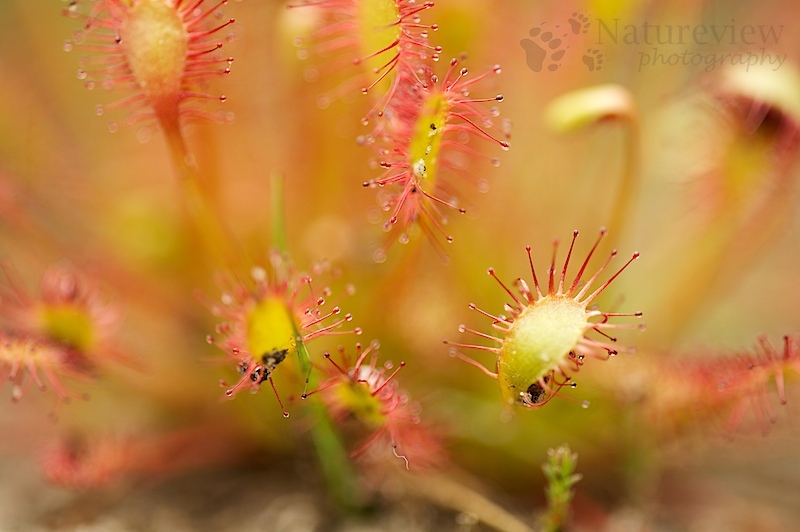 For many people Sundew is a fascinating plant. They eat meat! A small plant, growing in very wet and very nutrient poor habitats and not often seen by many people. Their habitat is really nutrient poor, so they have to find their nutrients in a different way. They produce a sweet, sticky liquid that attracts insects. when these insects are stuck on their leaves, they fold around it and “digest” the insects, getting those hard needed nutrients. For a photographer this is always a very difficult plant to photograph. Not because they could be eaten by it, but the surroundings are often not the nicest. And when you’ve found an accessible plant, it’s hard to make an interesting composition as there are many leafs often causing a “crowded” image. For this picture I used a very narrow depth of field, focussing on a few leafs and drops… The black things between the leafs are the unfortunate insects trapped by the plant. Previous Post Previous post: Hup Holland hup! It’s good that you pointed out the difficulties in photographing this type of plant, in spite of which you managed to get an effective image. The only place I’ve ever seen a sundew is in eastern Texas, which gets more rain than we do in the semi-arid center of the state. The eastern part of the state is also home to the pitcher plant, another carnivore. Dank je, Joanna. Het zijn alleen geen waterdruppels, maar de lok/kleefstof voor de insecten.